Winner of 6 Book Awards! 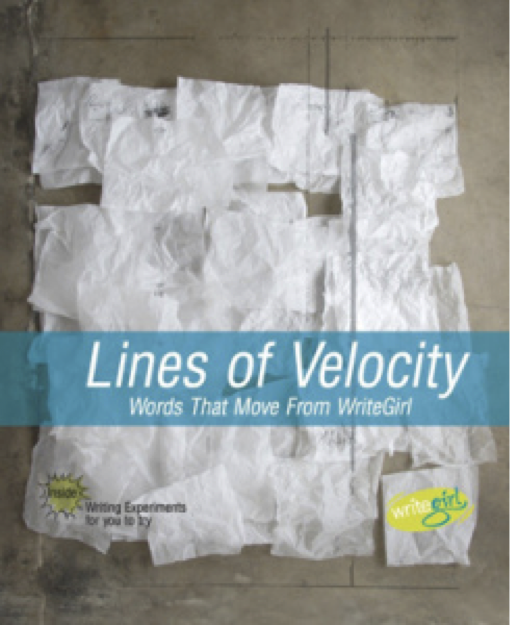 The 6th Anthology from WriteGirl Publications, LINES OF VELOCITY is a wondrous and diverse collection — stories, poems, songs, musings, rants and essays — showcasing the unique and eclectic female voices of new and accomplished writers from WriteGirl. Writing what you don’t know can be extremely difficult. It often involves a lot of research and care to make a piece sound authentic when writing with about a setting, occupation, or worldview you are unfamiliar with. However, 100% accuracy is not the foundation of a great story. Creativity is. Consider icons like Mary Shelley, who wrote Frankenstein, or J.K. Rowling, who wrote the Harry Potter series. Neither of them had experience with the things the wrote about. In fact, Rowling created a whole fictional world in her series. Both Frankenstein and Harry Potter are well-loved because of their authors’ imaginative power. Don’t be afraid to write what you don’t know. Today, write something you’re unfamiliar with. Pick an occupation that you have never considered for yourself, and write a day in the life of that world.